If you Google ‘how to tell if a saddle fits a horse’ or ‘does my saddle fit my horse’ most of the results come from just three sources: from production line saddle manufacturers, equine magazines and websites or horse forums. Let’s take a look at why this probably isn’t the most accurate information. "You should have two to three fingers of space under the gullet." Two fingers or ten fingers it doesn’t matter as long as the saddle doesn’t contact the wither or spinal processes. That’s it. There is no magical number. First of all, the gullet specification of a tree is taken on the bare tree before the saddle is built, right at the point where the fork meets the bar. After the skirting is attached, this measurement changes. So where exactly are you measuring? Some answers are: “where the rolled leather of the gullet joins the skirts” or “from concho to concho on the front of the saddle”. Gullet measurements are basically useless and guarantee nothing. 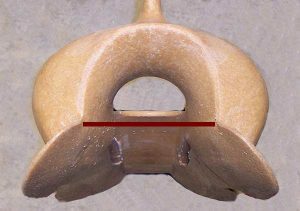 A gullet measurement only provides information on about one inch of the overall horse's back. “You will want to measure from the withers to the last rib bone. This measurement will give you the maximum length for a proper saddle fit.” Nope, sorry. First of all, the wither is a very arbitrary area. A rib cage measurement should be taken from the back edge of the shoulder blade to last rib about three inches down from the center of the back. Secondly, this is accurate for an English saddle only because they don't have tree bars that extend behind the cantle so this correct. On a western saddle, No way! On a western saddle you can't apply the last rib rule. If we did, we couldn’t make a saddle with a seat larger than 12 inches, basically child size. A tree with a 12 inch seat is going to have a bar length of around 19 inches. On average, a Quarter Horse has a nineteen inch rib cage. 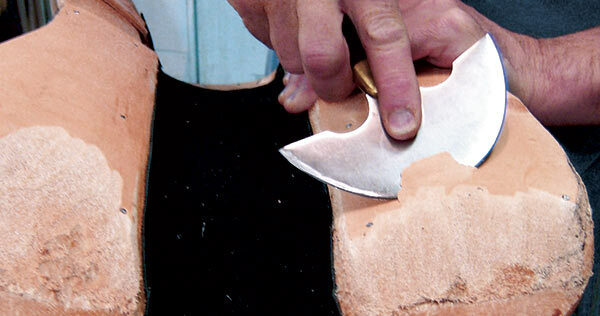 For western saddles the rule of thumb is the base of the cantle should not go past the last rib. Skiving leather on the bottom of tree. In the old days, before the mass production era, most riders got their saddles from saddle makers in their local area. The maker would come out to the customers place with several trees and find the one that was the closest to the horse’s confirmation. If needed he would then glue leather to the bottom of the tree and then skive (or sculpt) the leather to fine tune the fit. What a great idea. The guy actually making the saddle took responsibility for fitting it to the horse. In the mass production era the majority of saddles are being bought with little or even no measurements being taken for the horse it will be used on. There are riders who will buy saddles from big online resellers by just picking a seat size for themselves. Others go to the local tack shop and might take a wither tracing along with them. 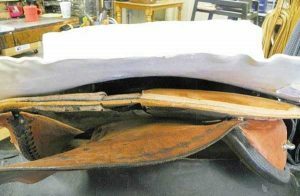 When we used to do the big horse expos I don’t know how many times I would see riders walking out of the building with a brand new saddle under their arm and a big smile on their face. The mass production saddle companies control most of the dialogue about saddle fit. They have the most advertising dollars; they have the most exposure to the masses. Have you heard the saying “History is written by the victor”? 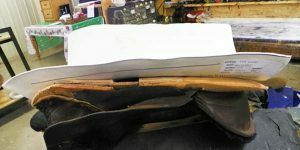 These big manufacturers have a vested interest in selling the idea that you can fit a horse’s saddle simply by picking narrow, medium or wide. The trees they build on are based on what they think the average narrow, medium or wide horse’s back looks like. When talking about the width of a tree what we are technically talking about is the bar spread, the distance the bars are set apart from each other. 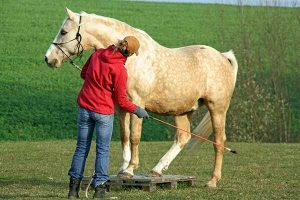 A horseback rider might have a saddle with the correct spread but the bars could still be set at the wrong angle for their horse or might not be making any contact in the middle of the tree. Furthermore, the width of the tree says absolutely nothing about the other twenty-two inches or so of the tree and what kind of contact is being made. These companies are the ones who first coined the phrase ‘hard to fit horse’. They blamed their inability to fit your horse on your poor choice of animal! It’s not that the horse is hard to fit, it’s just they can’t fit that horse because of their limited tree choice. Look at the before picture of an EQUImeasure mold sitting in the upside down tree. Wide tree, wide horse, but look at how much open space there is in the middle. There isn't a production line saddle in existence that would ever fit this horse. But we did! 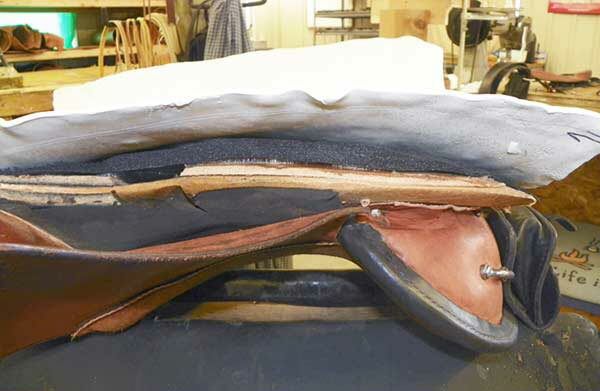 In this case filling in the void area with leather would have added three to four pounds of weight to the saddle. Instead we used a half inch sheet of poly to reshape the bottom of the tree to fit the horse. Please recognize this is a far superior way to fix the problem versus shimming a pad. If the saddle pad shifts around under the saddle, the shims move out of place. By addressing the fit issue at the tree we have insured that the filled in area will always stay exactly where it needs to be. So the riders who actually want to do better for their horse try to educate themselves on saddle fit. They turn to an “unbiased source” (sarcasm alert!) like an equine magazine or equine website. Once a year, almost every horse related magazine or website will run an article on saddle fit. Who do they turn to as their expert for saddle fit? It’s always either a high profile horse trainer or a representative from one of big production companies. Let’s start with horse trainers. In the last twenty years I have met hundreds of horse trainers. I have met less than a handful who had any clue about saddle fit. The ones I’m talking about had actually built a few saddles. They had also stripped saddles down to the bare tree to see what was going on under all the leather and sheepskin. They made adjustments to the tree and then saw how well it worked. They learned by doing not by repeating things that they heard! When it comes to saddle fit, the average horse trainer is, well…, average. They might have picked up a couple of things but for the most part they use the same worn out saddle clichés that everyone else who only know enough to be dangerous uses. ‘It’s too wide’, ‘It’s too narrow’, ‘it’s bridging’. Please, stop you’re killing me! They don’t want their client to think they don’t know everything about horses so they feel obligated to provide an answer. People ask CJ and I for horse training advice all the time. We might have pointed out to them that their horse was a bit asymmetrical so they ask how they can address the issue. Guess what? We politely tell them that we are saddle makers and that question would be best answered by a qualified horse trainer or riding instructor. We believe it's OK to say "I don't know but I can point you in the right direction." Now, CJ and I have trained all of the horses we have had but that doesn't mean we're qualified to give horse training advice. You can't be an expert at everything and sometimes it just pays to consult a professional. First of all, production line saddles companies do not fit saddles to horses any more than Nike personally fits you for a shoe. So how are they an expert in saddle fit? Secondly, when a representative from one of big production companies is used as an “expert” obviously he is going to sell the story that allows their company to sell the most saddles. Over the years we have advertised in these magazines and websites and I would always try to get them to let me write an article that would actually help riders with real information on saddle fit. To date, it’s never happened. Here is the reason why they use quasi-experts instead of real experts. First of all, they use the big saddle company representative because their company is running full page color ads. If the magazine or website ran a real in depth article on saddle fit, the big money saddle advertisers would be upset and might pull their advertising. Secondly, most high profile horse trainers have endorsement deals with big saddle companies! So reason two is basically the same as reason one: it’s all about the money. Imagine that! Unfortunately for the rider, it is in all of their interests to dumb down the subject and keep the reader in the dark. Did you know that anyone can post their opinion on a forum? Almost enough said right there! The average guy posting on a forum is, well…, average. Most posters on forums are simply repeating what they heard around the barn or what some trainer said. Out of the three sources, online forums probably have the most misinformation on saddle fit. It’s all just the same with the clichés and ‘my horseshoer said' or 'my neighbor said’… Once again, please, stop you’re killing me! Saddle fit is all about how much contact the saddle makes with the horse’s back. A wither tracing, a gullet measurement, etc. is not enough information to fit a horse properly. In order to get a saddle to fit your horse you have to take into account the entire back of the horse where the saddle sits. Right now the best way to fit a tree properly is with the EQUImeasure Kit. You can turn the tree upside down and place the EQUImeasure mold in the tree and see exactly where you have contact and where you need to fill in the space. You can change every aspect of the bar, rock twist and crown. It's the simplest way to do the job right and take all of the worry out of saddle fit! I learned that, “saddle fit is all about how much contact the saddle makes with the horse’s back.” That’s my take away. It was an excellent article in my opinion, but I could be wrong. I would have readily read about what the EQUImeasure kit is, who makes it how it works, etc. Hey Ken, you’re right, saddle fit is all about maximum contact! As far as the EQUImeasure, it was invented by an endurance rider that was frustrated by the status quo in the saddle industry. After four or five years they were going to go out of business because not enough people cared so we are actually the only licenced reseller. We oversee the manufacturing and the distribution now. I love these informative articles, I read everyone you write more than once. I’ve tried to correct forums on the web, some people are so misinformed they don’t want to hear the truth others are just too dumb to recognize it when it’s put forth in small words. I deal with trainers all the time, they have a huge problem too many horses with different body types, so they find the best overall saddle that works on the most horses. This is not an excuse just a fact for them. The sad part is they don’t know enough about fit to educate their clinientel, so they can get a saddle that fits the horse. Too bad owners don’t spend more time fitting the horse they ride all the time, their fanny and the horses back would benefit. Thanks for the kind words, Diana! Donna Snyder-Smith once said to me “You can lead a rider to knowledge but you can’t make them think!” A horse has no awareness of the $70k horse trailer or the $60k truck to pull it but I can guarantee that they are aware of a $400 dollar saddle on their back. Great article! Getting a saddle from you was the best thing I could have done for us! I agree with everything you say and truly believe it. Both me and my horse love my saddle and it was a good investment. My husband told me when I was looking for a saddle that I should get a custom saddle to fit my horse. He said I would have a garage full of saddles that would not fit. I have listened to people with problem saddles and suggest a fitted saddle but they keep doing what they’re doing! Thank you Synergist for my saddle!